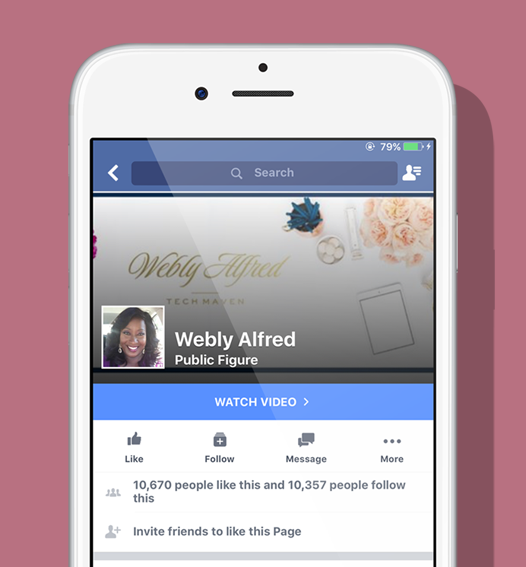 Is your Facebook fan page attracting paying customers? When you have an online business you’re very eager to help others and serve them with your gifts. So you start by following the gurus and apply what they are suggesting. One of those suggestions is to give value using your content. So you start building an editorial calendar promising yourself that you will blog twice a week to start building your list. In my experience, blogging and creating social content just to be consistent and show up without having any real purpose is a common mistake that can leave money on the table and not attract paying customers. Sometimes simple shifts can make a huge impact in attracting paying customers. 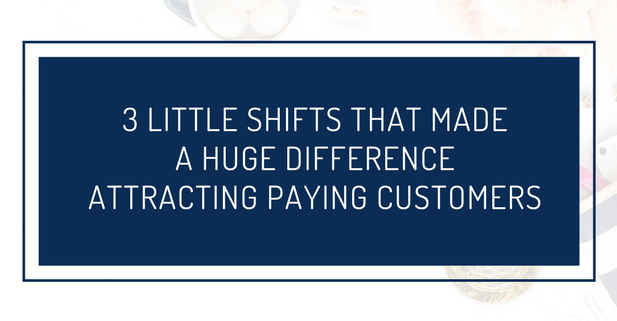 Here are 3 small shifts that I made that has attracted more paying clients. No longer do I open a word document and start writing simply because I promised myself I would write a blog every week. Reverse engineer writing contents. How? Start with the offer or the action you want the reader to take. 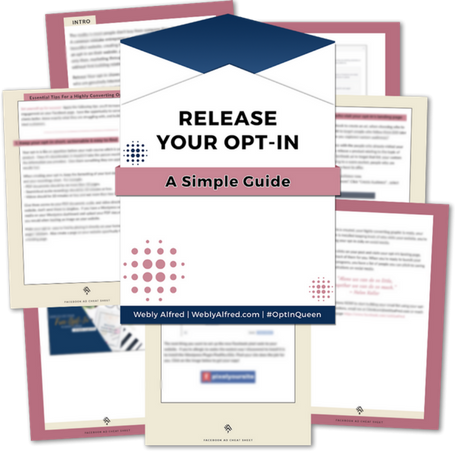 Get a copy of your opt-in freebie. Sign-up for a free consultation with you. Watch your latest live broadcast on Periscope or Facebook. Start with the offer, because once you know what your offer is (the entree) you can write an epic blog post (the appetizer), and your call-to-action is easier to determine. I get it, you just started and you don’t have an audience yet. “Who’s going to read my blog” you wonder. You have to bring the blog to where your audience’s eyes are: their mobile devices on different social media platforms. Share your blogs on Facebook. Share your blogs several times on Twitter. Get on Facebook live and talk about the topic of your blog post; let people know that you go into greater details in your blog post. Create a Facebook ad to generate traffic the post and increase visibility to attract paying customers. The benefit of this is that can you bring your blog to your potential audience so they can see your offer and give you their email address in exchange for your opt-in. You see, your products are not the only things you should be marketing; you have to market your knowledge to establish yourself as an expert. It is true that you have to give value to build relationships but that doesn’t mean that you never “SELL”. My favorite book on the topic is GaryVee’s Jab Jab Upper Cut. You’ve worked at creating epic blog posts. You are sharing your blog daily and letting your audience know that you are an expert at solving their problems. Now, it is time to ask for their business. Don’t be afraid to share your offers. In my experience, many times people are waiting for you to say “This is definitely something that I can help you with.” We get too shy and we’re afraid of sounding like a businesswoman we don’t ask for the sale. My friend YOU are a business. Your craft is for sale, but no one will know that unless you sell it to them. These 3 little shifts made a huge difference for me. I focused on sharing my content with purpose because I wanted to start attracting paying customers who were struggling with the problems I was blogging about and sharing on my Facebook page. Plus, because I am creating content on purpose, I don’t get stuck not knowing what to blog about because I start with the end in mind. This shift has been amazingly beneficial for me. So, what about you? 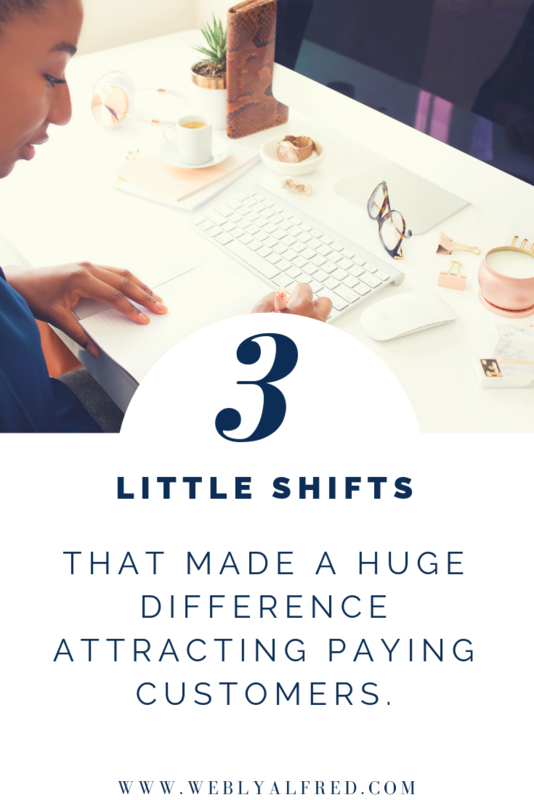 Which one of these little shifts can you put in place right now to start attracting paying clients? The simplicity of this is really helpful. It motivated me to change my free gift and then post to FB, Twitter, etc. and have a FB Live session on one’s Life Purpose. Thanks Webly! Switching things up a bit will definitely help you turn your audience into friends before they become customers Candess. Love your advice to “don’t write blogs just for consistency”. This is such wonderful advice, and one I have been pondering. Good to see you recommend! Thank you for the compliment on my website. You’re not alone in blogging just to blog. Once you put the person you’re serving first, it all suddenly clicks doesn’t it? I started my blog for the purpose of making myself accountable to write and didn’t really have much of a plan apart from that. I have concrete goals now and your advice makes so much sense. Glad that with accountability that you can now comfortably move into a direction that makes more sense for you and your business. I feel that this whole blogging until your fingers dropped comes from a school where it was all about traffic on your site. People are somewhat desensitized and want more results now. Hey Webly, great content here! I mostly do the things you suggest, however, I don’t feel I do them as good as you get into – especially the reverse engineering one. I am taking that one away and going to work on. Thank you. Plus, I know I can always get better in the mindset of selling so I appreciate that referral too. Teresa, we have a limited amount of time daily, it’s good to use it with purpose even when we’re serving our audience. I am confident you will turn this around in no time. You have amazing content on your Facebook page and your blog. Katarina you do an amazing job sharing about your expertise in wine. Yes asking for the sale is ok considering the incredible value you give. I am not a wine person, the amount of information you share on your blog can turn a novice into a little connoisseur. These are great reminders to keep one’s self in the loop. You do not want to be forgotten! Webly, what great strategies. It’s always good to look at things from a different perspective. I think when we start out that we’re in the follow-the-leader mode and do what’s suggested. I’m going to rethink everything you mentioned in regards to what I have been doing. Thanks so much for the eye-opener. Thank you for the great advice! I didn’t know what to post on my Business Page! This makes so much sense! ???? Hey Christie, I am glad that this post gave you the clarity you needed to move forward with your Business Page. Good luck!